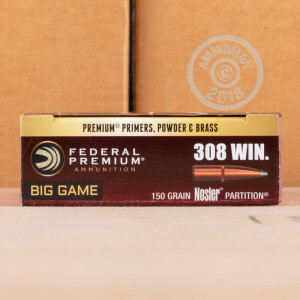 These .308 Winchester cartridges are a dependable hunting load that uses Nosler's renowned Partition bullet. 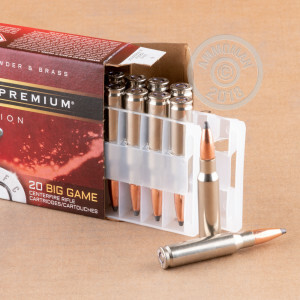 Each round fires a 150 grain version of the Partition at a muzzle velocity of 2,840 feet per second, generating excellent long range performance that will serve you well against deer and other wary game animals. The Partition bullet is a dual core design weighted to the rear to produce heavy penetration. Upon contact with the target, the soft point of the projectile strikes the target and ruptures the tapered jacket to produce a high diameter mushroom. 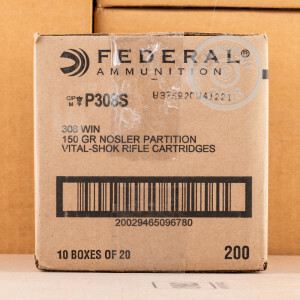 This ammunition is loaded in Anoka, Minnesota and uses reloadable brass casings and non-corrosive primers. All orders over $99 at AmmoMan.com ship for free. Buy in bulk and save big!